Last tuesday, Lucas Newman (developer of Delicious Library) and I built the entire game within three days for C-4 Iron Coder and we won 2nd place next to Video Conference for iPhone. Download link and brief installation instructions is at Lights Off website. 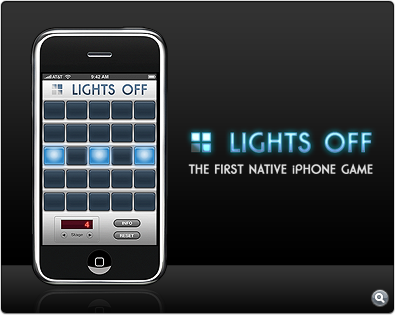 I’ve always loved Lights Out game from Tiger Electronic and iPhone with touch screen couldn’t be any more perfect for Lights Out-type game. This game is freeware and you should use it at your own risk. I’m not going to provide detailed installation instructions here as it’s fairly complex but I will update this post with a link when there is one. Wow. Simply amazing work, both graphically and… programically? Lovely graphics as usual. All I need now is an iPhone. Any possibility of getting source code? Congrats on the win! The graphics are outstanding as usual! If there are solutions, I would love to just see level 8 solved. But great work. I play with this game more than any other application on the phone. Keep up the great work! Just out of curiosity, are you or the devs ever going to port this to an actual OS X application? I can imagine it wouldn’t be much to make it with the same interface, just a little menubar with the close, min, max buttons. Alternately a widget would be incredible! Level 8 can NOT be solved. Can you guys please remove the never-to-be-solved-spend-hours-of-frustrated-playing-only-to-get-angry-when-you-find-out-it-has-no-solution levels out of the game? That applet confirms that you cannot solve level 8. The closest I can get is one square in a corner! After such widespread publicity, it’s astounding such a basic problem as winnability has been left unresolved. As good as a game may look, one shouldn’t recommend a game that is not even 10% beatable (linearly). I admire your iPhone development skills, as well as your aesthetics, but to call an unsolvable problem a “puzzle” or “game” is false advertising at best and a frustrating waste of time for those who would really enjoy it the most. I’ve tried to contact him, but so far have not had any response. Perhaps he did answer me and my spam filter killed his response without my knowing. I’d love to make the game available to others, but it would be better if he could re-activate the link that’s on Versiontracker. I’m still working on it. I beat level 8 but am stuck on level 14. It is in fact possible to beat level 8 as I did not skip any levels before this. Yes, level 8 is solvable. I don’t know jack about the math of it or using other java solvers, but I solved 8 after much trial and error. just try solving them instead of putting them on a program that does it foe you. It takes the fun out of it, and its not even acurate. ok dude yall are all dumb, 6 is the only hard level!! I sorta agree with Kyle Nilson. I am looking forward to one for mac os application and that would be much incredible if there’s a widget of it. Umm, the only “unsolvable” level for me is 6, I’m having trouble converting that layout into a solvable mid-pattern. Damn! yes the only level that is even hard for me is level 6. I can beat all 211 of them in about 10 seconds. They are not unsolvable… they are quite easy onvce you figure them out. I have solved level 8. it is not unsolvable. i will later post a video of level 8 if you do not believe me. 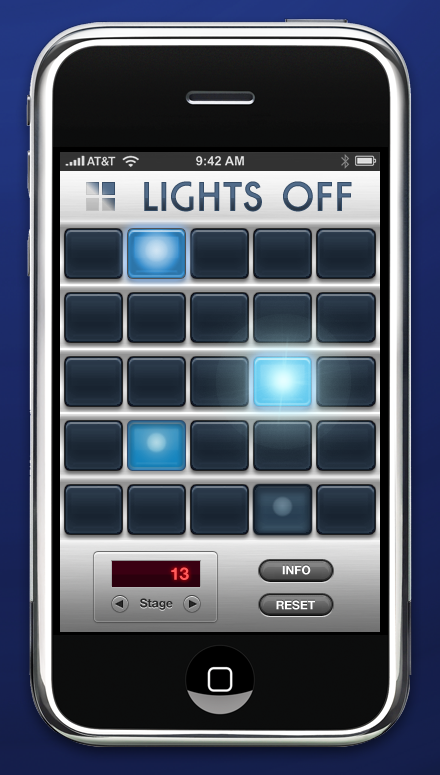 level 6 is solvable with 6 taps. i solved lev 8 with 12 taps. Please _do_ post your solution! since each position needs to be tapped only once and the order is not important (see Wikipedia article), there are 2 to the power of 25 possible was to play this game. I have written a trivial program to tests all those, and still havent found a solution for one of the early levels (6 or 8 I think). So please post your solution!